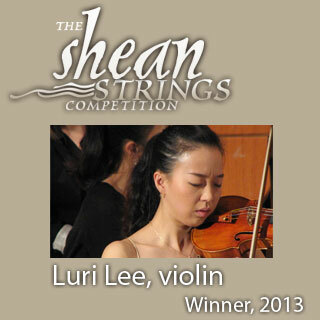 Violinist Luri Lee completed her Bachelor’s Degree at the University of Toronto under the tutelage of Erika Raum and later earned her Master’s Degree at the Peabody Conservatory of Music with Pamela Frank. She recently completed her Artist Diploma Program at the Glenn Gould School studying with Paul Kantor and Barry Shiffman, generously funded by a Chancellor’s Scholarship. Festivals she has attended include NAC Young Artist Program, Kneisel Hall, and The Banff Centre, among others. Ms. Lee made her Carnegie Hall début in 2011 collaborating with Peabody faculty members, including ’cellist Michael Kannen. In the fall, Ms. Lee has been accepted in the prestigious Fellowship Program at the Glenn Gould School. As a fellow, her upcoming concert engagements include chamber performances collaborating with Barry Shiffman at the Music in the Morning in Vancouver, a part of the complete Beethoven violin sonata cycle with pianist Anton Kuerti and Tchaikovsky’s Violin Concerto with the Royal Conservatory Orchestra conducted by Julian Kuerti. Ms. Lee plays on a fine modern violin made by Samuel Zygmuntowicz generously loaned by The Banff Centre. Read the 2011 Shean Strings Results media release. The application process for The Shean Strings Competition 2011 is now closed.